Last Owner: Inver House Distillers Ltd.
distilleries were also built during the reconstruction of the mill; Killyloch and Glen Flagler. If you know your Scottish geography you immediately react and wonder why they chose the name of Killyloch when the local water source is named Lilly Loch. OK, perhaps not too common to name your distillery after your water source after all. Anyway, this was simply due to a mix up of the templates that were used when marking the casks. It seems to have been more work to repaint the casks than change the distillery name, so they went with Killyloch instead of Lillyloch which was originally intended. So, now we have a huge grain distillery and two malt distilleries. Why not add a couple of warehouses? And why settle with a couple, they built 32 of them. Add to that the biggest malting operation in Europe, a cooperage and a large bottling and blending plant. Moreover, Glen Flagler boasted at the time the biggest mash tun in the whole of Scotland, made of stainless steel. These guys were ambitious. The spirit stills of Glen Flagler were onion-shaped and had broad short necks. The wash stills were interestingly enough replaced in 1969 to support continuous production. This is a special solution and the aim with this was supposedly to produce something more akin to what the American market might have wanted. The third, not yet named single malt made here was an attempt at making peated malt and a recipe variant. It was named Islebrae and supposed to have been made at 15ppm or as high as 40ppm phenols as some claim, unclear which one is correct, perhaps both? Killyloch was unpeated and Glen Flagler probably lightly peated at ~3ppm. Unfortunately enough for this ambitious operation the market turned south and operations ceased for Islebrae and Killyloch already in 1970, a very brief existence indeed. The maltings were sold in 1978 but Glen Flagler survived until July 1985 when it too were closed and demolished. The grain operation survived for another year but were sold in ’86 and ultimately demolished after another two years in 1988. Today the bottling and blending plants remain alongside 37 warehouses with room for some 500.000 barrels and office buildings. The complex is used extensively by Inver House Distillers who operate the Balmenach, Balblair, Knockdu, Pulteney and Speyburn distilleries. Glen Flagler and Killyloch has both been released in recent years as super exclusive distillery releases (I have seen prices at around 500 to 1000£). 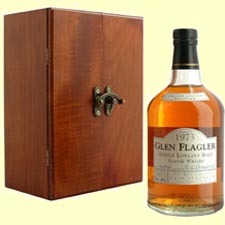 Glen Flagler was released in numerous distillery bottlings and all are today collectors items. Both also exist as bottlings from Signatory who to my knowledge are the only ones that have bottled these as independents, rare to say the least. Islebrae is probably one of the most difficult malts to locate. I have personally only sampled one bottling of Glen Flagler, and unfortunately in a somewhat intoxicated state (sacrilege I know…), but found it lowlandish in style. That being quite dry, citrusy, grassy, lightly spicy and refreshing. Some claim the Killyloch to be sweeter in character than the Glen Flagler. Hopefully I can prove or misprove that myself within my lifetime. All in all an ambitious project which unfortunately for us Lowland-lovers was tragically short-lived.